The United States of America (/əˈmɛrɪkə/; USA), commonly known as the United States (U.S.) or America, is a federal republic composed of 50 states, a federal district, five major self-governing territories, and various possessions. [fn 6] Forty-eight of the fifty states and the federal district are contiguous and located in North America between Canada and Mexico. The state of Alaska is in the northwest corner of North America, bordered by Canada to the east and across the Bering Strait from Russia to the west. The state of Hawaii is an archipelago in the mid-Pacific Ocean. 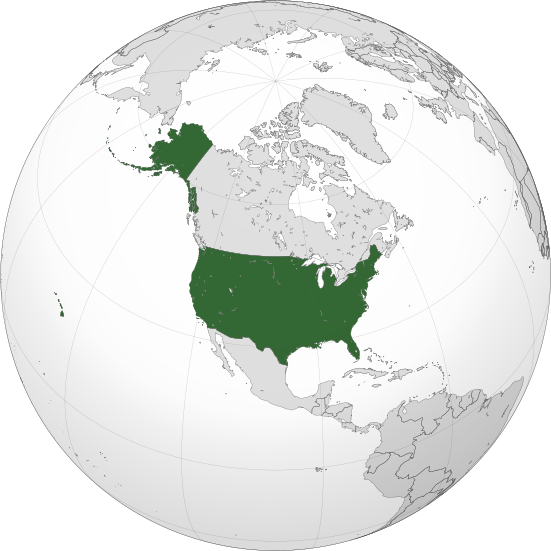 The U.S. territories are scattered about the Pacific Ocean and the Caribbean Sea, stretching across nine time zones. The extremely diverse geography, climate and wildlife of the United States make it one of the world's 17 megadiverse countries.